Well yesterday was a great day really. I headed in to London to see my old friend J who runs a very funky graphics design agency. We had a great meeting on how I might be able to help build awareness for him and his creative work now that I’ve sharpened up his online presence. All very exciting. En route to meeting up with him near Waterloo, I drove in to north London and parked up my car very close to where we used to live on Muswell Hill Rd. 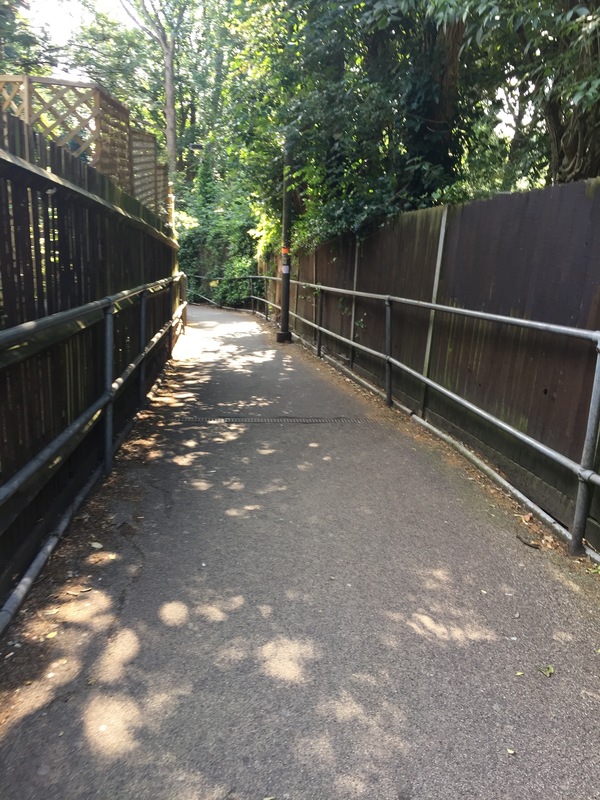 It was lovely to walk through Highgate Woods again on the way to Highgate underground station. Now you may not know it but because of the hilly terrain, the station was built in a deep cutting excavated beneath Highgate Hill. During the war, the deep-level platforms at Highgate were used by many as a shelter from the bombing of London by the Luftwaffe, and, later, V-1 and V-2 missiles. The entrance is a long way down. You can in fact get an up escalator to the surface from the booking hall but there’s only one way down via a steepish path. I’m not sure these pictures do it justice…. So it’s viva Espana at long last. A good final I thought but not a thriller and the right team won. Brilliantly taken goal from Torres who is quite a player. Liverpool are privileged to have him. Pity about the tattoo though – just why do footballers want sanskrit on their arms? One result from yesterday that caught my eye was in th Womens’ Football World Cup where Brazil beat the seemingly unbeatable USA team 4-0. I think that’s the US team’s first reverse in over 50 games. It’s hell of a run but I’m glad it ended because, well, they stuffed England in the, yes, Quarter Finals. I’m tempted to think that instead of gold stars for WC wins we should add the letters QF beneath the 3 Lions on all England team shirts, signifying our love affair with major tournaments almost always ends at this point.